This is a portrait of Katherine Osterhaus Koopmann, my maternal grandmother's family, probably taken about 1908-09. 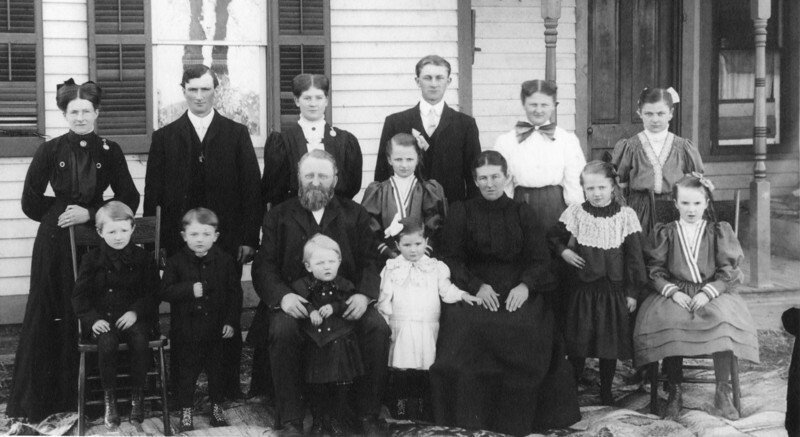 Other than my great-grandparents Henry and Charlotte Foerster Osterhaus, the only two we are certain about are the two on the far left: Kate Osterhaus Koopmann (dob January 3, 1880) and her brother Mathias (February 15, 1899). Back Row: Kate, Henry (September 18, 1881), Elizabeth (October 17, 1886), Emma (May 7, 1894)(with bow in hair), Frank (September 15, 1884), Therese (February 15, 1889), & Anna (July 10, 1891). Front Row: Matt, Joseph (May 6, 1901), Great Grandpa Henry (March 9, 1851), Al (January 7, 1907)in front, Martha (October 9, 1902), Great Grandma Charlotte (February 9, 1860), Agatha (April 14, 1897), & Clara (September 27, 1895).